Usually with summer means family road trips and more time spent in your car, and by the end of summer your car is in need of some deep cleaning. At least that’s how mine is looking at the moment, with a family of four it’s hard to keep a car organized with sippy cups, toys, and sticky messes. 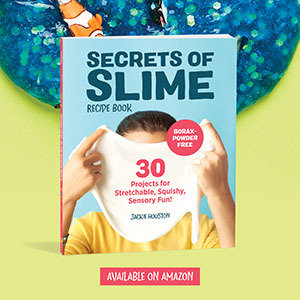 Luckily, there are some hacks out there to make our life a little more easier and cleaning or organizing our car a breeze. Check out some of our favorite tips below and enter our giveaway! Click on the links below for the articles. Keep the kids entertained and snacks/toys organized with this this easy to make chalkboard activity tray. Cut down clean up time with this genius hack using cupcake liners. Use $1 shower caddies for food and drink holders, which means less mess so the kids aren’t balancing their drinks on their laps. Save those little hands from getting singed from sun-baked belt buckles using this genius tip! Convert a cereal dispenser into a trash can for easy clean up. Who knew you could use toothpaste to clean your headlights? Use a rubber band as a iPhone car mount holder. 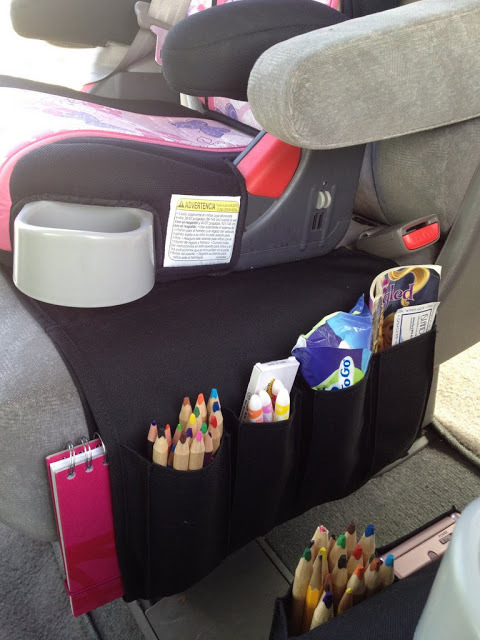 Hack a remote control holder into a kids travel caddy, this is brilliant and the perfect size for crayons, sippy cups, and snacks. 9. Or make a car organizer out of a dollar store shoe organizer. 10. Use these smart tips for really deep cleaning your car, including how to clean that stubborn dirt and dust in your vents. 11. 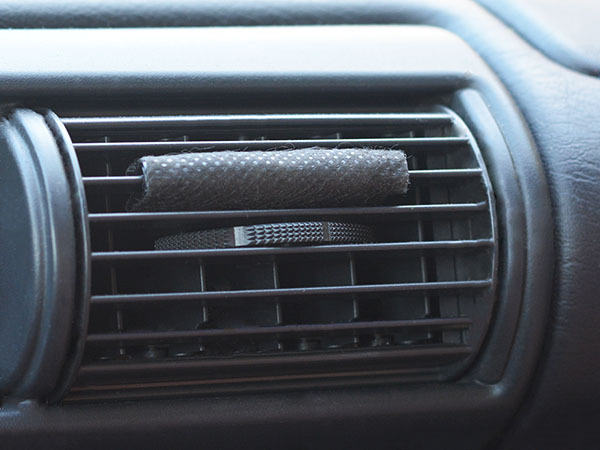 The one product that will rescue your stinky car….PERK Vent Wrap Auto Air Fresheners. As much as I try to not let the kids eat or drink in the car it’s pretty much inevitable. Juice ends up leaking on the seats, milk splatters when the bottles fall out of the cup holders, and snacks crumbs end up all over the floor which ends up leaving you with a not-so-nice smelling car. Each PERK Vent Wrap lasts about 15 days, so a 4-pack offers up to 60 days of your favorite fragrance and no one even knows it’s there! Vent Wrap doesn’t block air flow from the vent and allows your vent to be adjusted as needed, unlike other vent air fresheners. And works whether the vent is on or off. 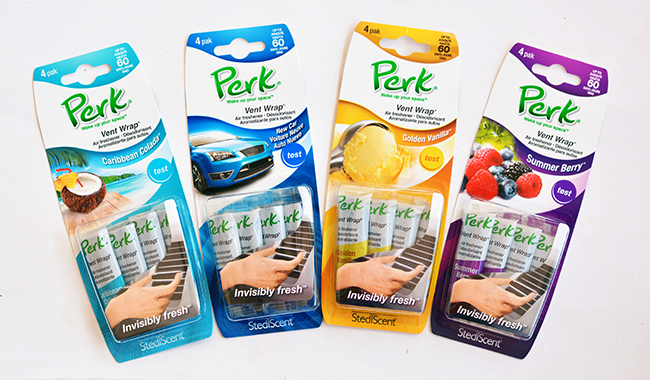 PERK is an innovative brand of automotive air fresheners offering long-lasting, high-quality fragrances in a variety of formats to fit your lifestyle. StediScent™ technology delivers consistent fragrance that is the same from the first day to the last day. Available in a variety of amazing PERK fragrances, including favorites such as Golden Vanilla, Caribbean Colada and New Car. 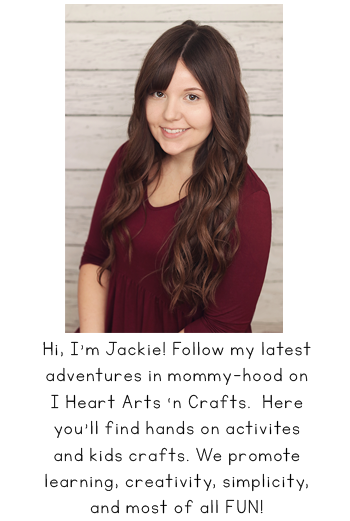 Want to try the PERK Vent Wrap auto air fresheners for yourself? Enter for a chance to win our giveaway below or you can also buy them yourself at Walmart, Target, Advance Auto Parts, AutoZone, Meijer, Kroger, Pep Boys, Publix, CVS, and other places auto air fresheners are sold. Grab your $1 off PERK coupon. Follow PERK’s Facebook for more information. 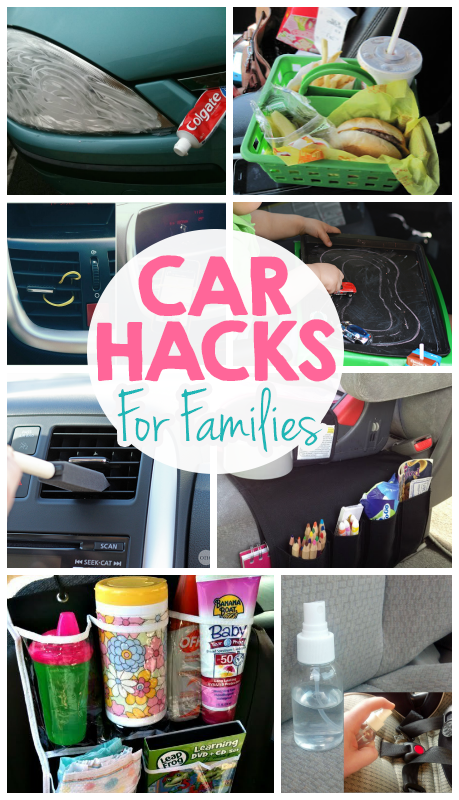 Looking for more inspired ideas on how to optimize your car for littles? 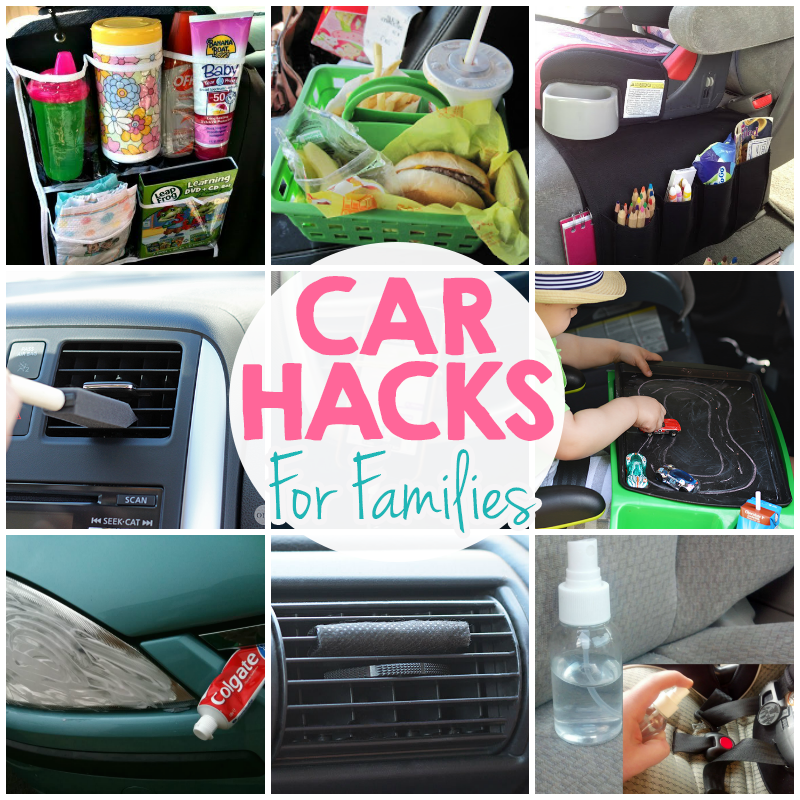 Check out our Family Road Trip Hacks for even more great tips! And don’t forget to pin this and follow us on Pinterest. I like the kids travel pack. That is a great hack. I’m going to try more than a few of these. Also the vent wraps are a genius idea! I want to slap myself for not thinking of these hacks sooner! I love the shoe organizer and the caddy! All the things look so organized. I love these hacks! I hate it when the kids have to bring so much stuff, then they will scatter them all over the car. These are great tips to keep everything organized. The PERK scent that I would most like to try is the Caribbean Colada. It is very nice to get things in the car organized. I love the backseat organizer and the air freshener.